Greetings to (the lovers of) the old exotic and complicated. This question concerns my Mills 5 cent Lions Head machine which dates from about 1929. It has been in my family since the 60s, and it still works pretty well, and is in fair condition- un-restored. Lore has it that a local cop (off-duty, presumably) sold it to my folks for $100 in 1966. This can't be normal, but I don't know if it's a common or obscure issue, or one which would be easy or difficult to remedy. Any insights? On the jackpot reserve trip lever, you have to set it as shown in the pic. The lever is currently in the "incorrect" position. 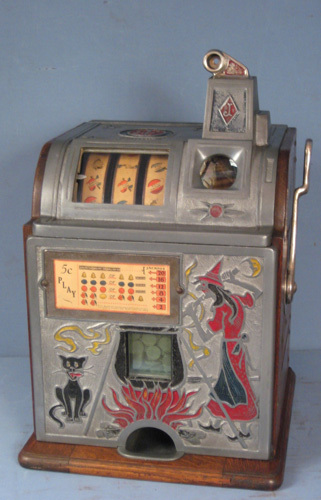 Remove the jackpot, set the lever and carefully re-install it on the casting being sure it doesn't slip out. This explains your leaking coins. With excitement and gratitude, I read your email with clear photos. Just to add to what is stated above if as you say "it seems to shut tight during play" when you pull the handle the slides come forward to refill if needed and reset and at the same time that the slides come forward they push on the main jackpot trip/reset linkage this would explain the "it seems to shut tight during play" statement, however if the main jackpot trip/reset linkage does not lock up in the reset position the flap will again open as shown in your photo! 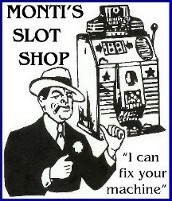 So from this I assume that your issue is the main jackpot is not fully resetting and holding! This could occur for different reasons, possibly the mechanism is setting to far back on the base plate or the base plate is to far back! This would cause the slides resetting to not go forward enough to fully reset the main jackpot trip/reset linkage! Also the linkage on the front jackpot may need a thorough cleaning when you remove it make sure all the linkage is free moving and not sticking due to old lubricant or worse dried grease which should not be used on these moving parts as grease will cause gumming them up! Also, your Lions Head has an inspection plate that is directly under the Lions Eye which has two screws inside that can be removed, this is there so that when you have the mechanism in the cabinet you can watch thru the opening to make sure that the linkage on the front jackpot is interacting properly with the mechanism payout slides coming forward on the handle pull! I hope this helps as it can be a little confusing to understand some descriptive photos below! Good description and information Monti! Your explanation on the reserve flap was good as well, as that is a common error when someone removes the front jackpot for cleaning, Etc. and places it back onto the front casting/glass! I've had a few come into the shop that way!